It was during our second trip to the southern part of India and our trip had a great start with a visit to the famed Tirupati Balaji temple as our first point of the trip. We had returned on July 7th, the birthday of your humble author - yours truly KT - from the Tirupati getaway and had a few hours before we had to proceed towards our next destination. The family used this brief gap in the schedule to huddle up and celebrate my birthday in style. A cake was brought in and cut to mark the occasion. After a small celebration, we got onto our preparations for the oncoming journey. At about 4 in the evening, we locked the house and left for the railway station towards our next stop - Rameshwaram. We boarded the Sethu Express from Chennai Egmore station at about 5:30 in the evening and thus began our journey. On the journey, we were made aware of the Pamban Bridge - the bridge connecting the island town with the mainland - along with its might and importance. 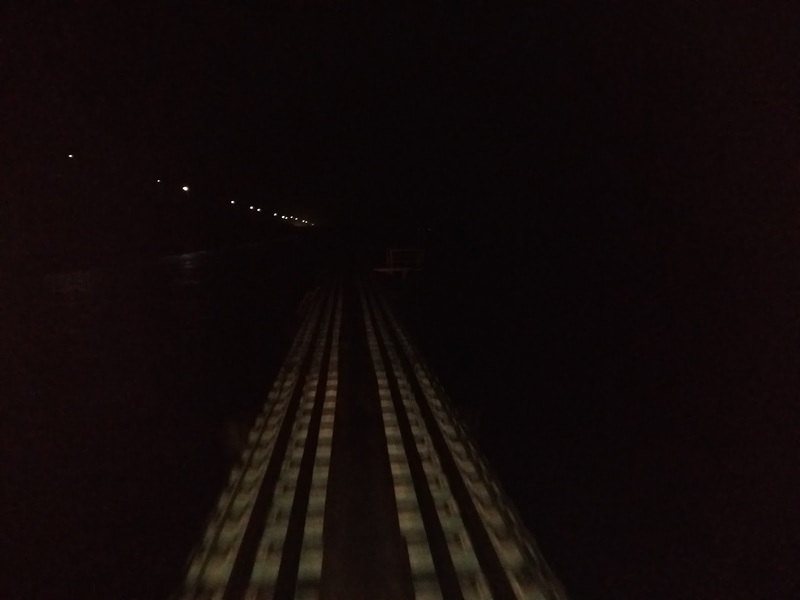 We set up an alarm for 4 AM just to be able to witness the train passing through the bridge and gasping at the familiar sound train makes on bridges. More about the bridge would come up during our return journey. The train entered the Rameshwaram railway station early next morning and we checked into our hotel. Rameshwaram is a small island town situated off the east coast of India. The town is connected to the mainland via two bridges - one each for rail and road. The place has its historic importance and finds mention in Hindu mythology. According to Ramayana, before going to Lanka Lord Rama performed Shiv puja here for victory. And it was later that at the same place Rameshwaram temple was built. Situated on the Pamban Island in the Gulf of Mannar, Rameswaram in Tamil Nadu is a major Hindu pilgrimage famous for its history and temples and is home to one of the 12 jyotirlingas, the Ramanathswamy Temple. Rameswaram, along with Dwarka, Puri, and Badrinath, forms the pious four destinations of the Chaar Dhaam (four cardinal points considered pious) pilgrimage. However, religion is not the only significance for this town. The town is the birthplace of most liked President of India - Dr. Abdul Kalam. The town is bestowed with one of the most somber beaches perfect for swimming. Further, the town and its suburbs are bestowed with scenic views of Bay of Bengal. A little while after we checked in, we were told that this is the best time to proceed towards the Ramanathaswamy Temple for early sphatik mani darshan. The special darshan is opened only for about an hour starting 4:30 in the morning. The mani was gifted by the Shankaracharya to this highly revered temple dating back to the 12th century. There are two categories of tickets to approach the darshan and we took the higher category to avoid the rush that was building up. Soon, we found ourselves staring at the pure crystal sphatik lingam rising proudly from the ground – it's a white glowing statue against the dark backdrop of the sanctum. The entire view is enticing. This, however, was just the start of the day and in fact, the temple visit itself just started from here. After the darshan, we quickly returned to the hotel to prepare for the rest of the temple visit and returned within an hour - this time with a bag of a change of clothes and without any gadgets. 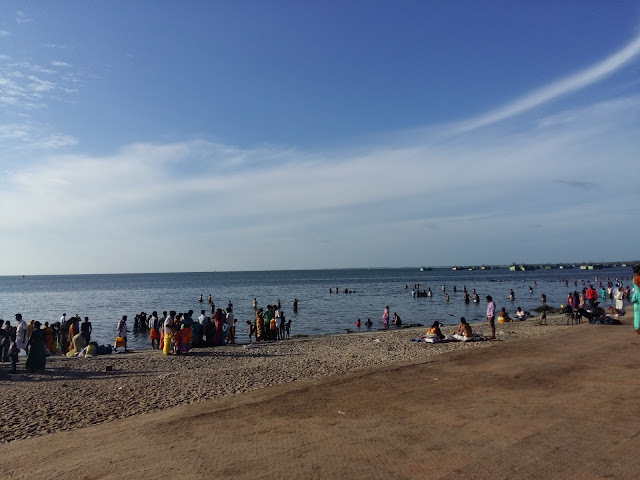 We first went for the Samudra Snanam or Sea Bath, at Agni Teertham, a pious location. We descended the stairs and slowly moved into the water with gentle waves welcoming us into the realms of Bay of Bengal. The water is one of the calmest among the sea beaches I have been to. We were advised to sprinkle a few drops of water from the sea on us. We did one better and with held breath, and among hums and noises of devotees from across the country, we took a deep in the cold sea water. While the dip is considered auspicious and the place has religious importance, yet the place isn't clean by any standards. People have littered it with anything they can and this shames the entire sacredness of this location. The Agni Teertham is located right by the temple about 500 meters from it. The holiest of the holy temple is a sacred destination of lakhs of devotees who come here for offering their prayers. The Ramanathaswamy temple is centuries old and is right at the center of the city overlooking narrow bazaar lanes with hundreds of small shops lining the street. The temple has artistic exteriors and the pale yellow color complements its look - showcasing a majestic and magnificent structure mesmerizing all visitors. After the Samudra Snanam, we had planned a series of the holy bath, a ritual of soul cleansing - a shower in water of 22 kunds or wells considered important to shed all ills done in life. The first one of this is believed to be under the sea and hence the sequence begins with the first bath in the sea. Other 21 wells are located within the temple complex. The guide took us through the arrows guiding us towards each well numbered and organized for convenience. At each well, the guide would pour a bucket full of water pulled from the well. Each of these is fresh water wells and has water of unique taste - sour or sweet - believed to have medicinal properties. In some cases, wells adjacent to each other had observable temperature difference. Once the bath was over, it was time for a small puja at the temple hall. Before the puja, we went to a room opposite to the temple, we had rented, for changing into dry clothes. There are many rooms available on an hourly basis for the purpose and it does come in handy if you wish complete privacy to dry up before darshan. Otherwise, the temple has separate changing rooms for ladies and gents but they do get a bit messy with thousands of visitors coming in every day. After changing, we proceeded to the main darshan. The temple is one of the 12 Shiva Jyotirlinga temples in India giving it a unique esteemed position from a religious perspective. As one walks through the multistoried giant corridors lined with simple yet artistically sculptured pillars (over 1200 in number). The corridor is considered to be the longest in the world with four sides different in length. The corridor gives a feel of a massive canopied interior structure. Soon, we were standing in front of the black stone Shivalingam, the primary deity of the temple. The sanctum is partially lit and the priest shows the statue with a lamp. We spend about half an hour in the aura of spirituality and devotion. As I closed my eyes and bowed to the almighty thanking him for all that he has bestowed us with, I felt humbled and lighter in heart and could feel the light shining towards the other end. In addition to the main Shiva temple, the temple also has many other deities installed in many smaller temples strewn all around the campus. These include Lord Vishwanatha, Goddess Parvati, Ashtalaxmi, Ganpati, and others. After the darshan, we returned to the hotel for a quick break. We shared our experiences of the holy bath and idols and the plan for rest of the day over a sumptuous brunch spread. After the meal, we were set to explore the natural beauty of this island. This marked an end to the visit to the town and we checked out of the hotel to continue the journey Our destination this time was Dhanuskodi, the tip of India, closest to Sri Lanka. Wandering individuals come together and start a journey!